Commdore Abdul Aleem (left) succeeded Rear Admiral Sinan Ertugrul (right) as commander of CMF's counter-piracy effort. The ceremony took place aboard British frigate HMS Cornwall in Fujairah and was attended by Commodore Tim Fraser, Deputy CMF Commander. (Photo: Royal Navy). The Pakistan Navy today assumed command of Combined Task Force 151 (CTF-151). 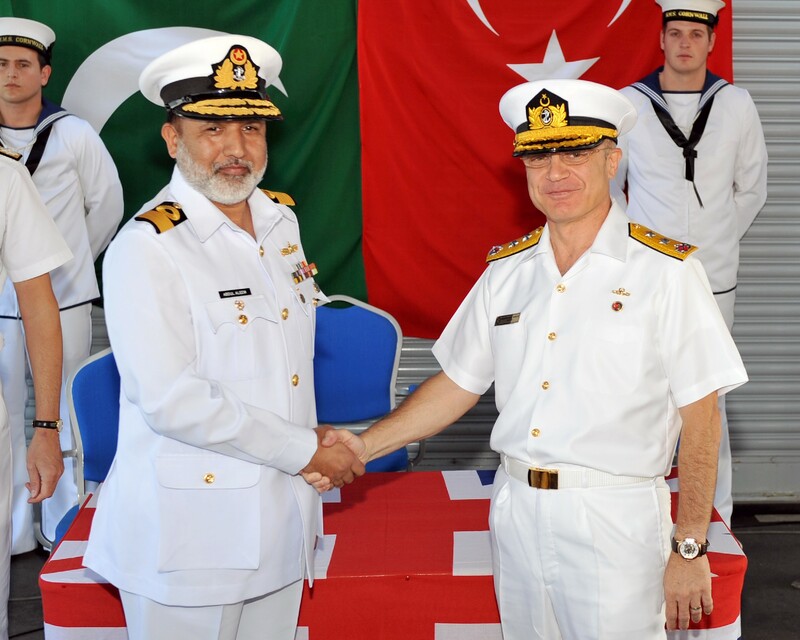 Rear Admiral Sinan Ertugrul of the Turkish Navy was relieved by Commodore Abdul Aleem of the Pakistan Navy at a formal ceremony aboard the British frigate HMS Cornwall in Fujairah, UAE. 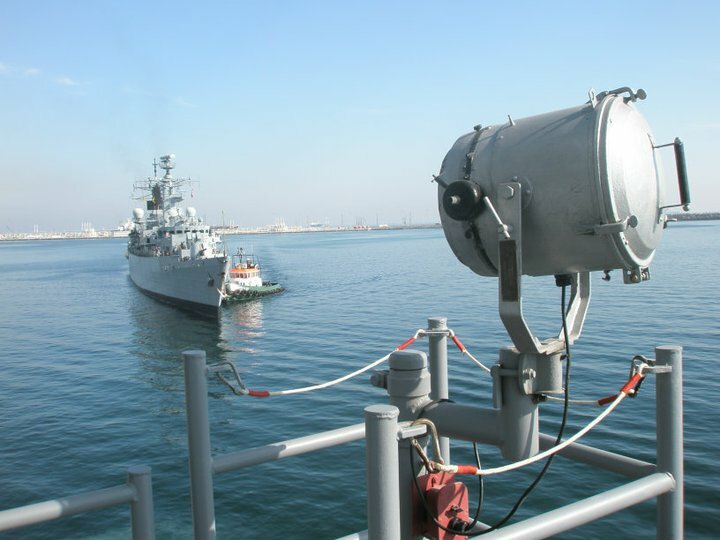 CTF-151 is one of three task forces operated by Combined Maritime Forces (CMF), a 25-nation coalition based in Bahrain. It was established in January 2009 in order to deter, disrupt and suppress piracy, protecting maritime vessels of any nationality and securing freedom of navigation for the benefit of all. CTF-151’s area of operation encompasses an area of 1.1 million square miles in the Gulf of Aden and Somali Basin. Rear Admiral Ertugral said that although led by the Turkish Navy for the past three months, CTF-151 has remained very much a multi-national effort. Over the past three months he has commanded ships from Australia, Republic of Korea, Pakistan, Thailand, Turkey, the U.K. and U.S, while his command team has included personnel from Canada, Saudi Arabia, Turkey, the UK and US. In addition to commanding CTF-151, RAdm. Ertugrul also served as Somali Basin Coordinator, managing cooperation between CMF, NATO and EU counter-piracy missions, together with other independently deployed navies. This enabled naval forces along the Somali coastline and in the vicinity of known pirate camps to be deployed with maximum effect, not only preventing a large number of potential Pirate Action Groups from reaching open water, but also deterring many from leaving the beaches in the first place. Relations between the three international counter-piracy missions were strengthened through extremely productive meetings between RAdm. Ertugrul and his counterparts from NATO and EUNAVFOR, together with the UN’s new special envoy on piracy, Mr Jack Lang. The CTF-151 Flagship made port visits for purposes of regional engagement and goodwill to Manama (Bahrain), Port Victoria (Seychelles) and Mombassa (Kenya) and, significantly, to Dar-es-Salaam, the first ever such visit to Tanzania by a CTF-151 Commander. Meetings with the Tanzanian Minister of Defence, Chief of Defence Staff and Chief of Naval Operations; the Seychelles Chief of the Defence Staff and Head of the Coastguard; and Kenyan Chief of the Navy, together with other local and national leaders, established a shared understanding of the importance of dealing with piracy and have created the basis upon which friendship and cooperation can be further strengthened in the future. Other major highlights during Turkey’s period in command include the daring recapture of the MV Magellan Star from pirate control, a major humanitarian rescue of refugees in the Gulf of Aden and the involvement of two Royal Thai Navy ships into CTF-151 for the first time, as well as an integrated British task group. British frigate HMS Cornwall arrives in Fujairah, UAE, to assume the role of flagship of CMF's counter-piracy mission. (Photo: CMF). This was the second occasion time Turkey has led CTF-151. Rear Admiral Caner Bener of the Turkish Navy was in command from May 3 2009 to Aug 3 2009.